The 10th anniversary of FINIA at Dilli Village is also a reminder that it was just 39 years ago that sandmining ended on Fraser Island after churning up about 200 hectares if dunes on Fraser Island. Half the area was in the narrow coastal strip between North Spit and Dilli Village. That was mined by Queensland Titanium Mines over a six-year period. Another 100 hectares was mined by Dillingham (after which Dilli Village is named) within two kilometres of Dilli Village and to the southwest of it. This much larger operation amongst the taller forests and well developed dunes only lasted a year and a half. Having spent such a turbulent part of my life working to stop the sandmining, I was keen to take an opportunity recently to see how accurate I was in my assessment of the impact of mining made 40 years ago. It was an interesting excursion being the first time for a few years I have actually ventured into the areas previously mined by Dillinghams. This is because it is both unattractive and off the beaten track and not easy to negotiate with so many dead trees and scratchy branches. However, on 27th October there was an opportunity and I checked it out again. My cursory inspection of an area mined in January 1976 confirmed that what I had predicted in the 1970s and what I had previously observed since mining and rehabilitation ceased in 1978. I believe that it will take hundreds if not thousands of years for this disturbed land to recover. First and foremost, the soil has to develop a profile. The podzolic soil profile happens to be the basis of the Fraser Island (Kgari) logo. For example, no eucalypts occur naturally in Dune System 1 (using Cliff Thompson’s criteria) because there is no differentiated A and B Horizons. Some Eucalypts, notably Scribbly gums and bloodwoods occur in Dune System 2 where definite A and B horizons can be observed and as these horizons intensify the trees grow larger. Still no Blackbutts (Eucalyptus pilularis) occur until the soil profile has developed much further into Dune Systems 3 and 4. Developing a soil profile in the mined area is taking much longer than even I had thought and I can’t explain why because in sandblows the transformation from Dune System 1 occurs with relative speed. For example, I can nominate a number of areas that were sandblows less than 40 years ago where natural plant succession now includes Eucalypts. Yet on the mined areas the only Eucalypts occurring now were hand planted and there are very few other plants that have volunteered other than wattles. Only a fraction of the plant species that once grew there are now evident and those that do such as Phebalium occur in a much lower numbers now than before mining. Wattles seem to dominate but almost all of the original wattles have succumbed to age and the next generation of wattles is much smaller and weaker. I remain amazed at the lack of biodiversity on the mined site. 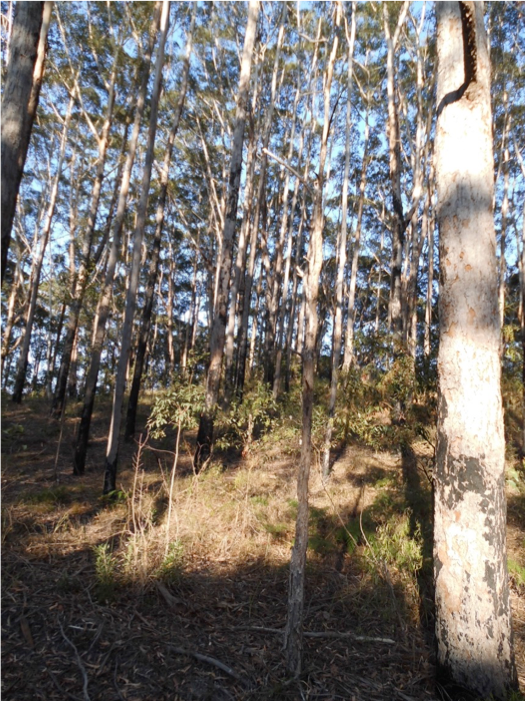 The most interesting observation I made though was the development of the Blackbutt trials established by the Queensland Forestry Department back at the end of 1975. This area wasn’t actually mined but it adjoined the mined area. It was Dune System 2 before it was cleared to establish a Blackbutt monoculture and the development of the Blackbutt defies the rule that Blackbutt don’t occur except in Dune Systems 3 and 4. I suspect that the facilitator of this surprising growth was the application of fertilizer that accompanied the planting. Whatever was done the blackbutt monoculture has defied the natural law of where Fraser Island (Kgari) plant communities should occur. There are some other notable features about all of the former Dillingham mine site. It is the lack of any small understory plants. The same seems to apply to the Blackbutt plantation. Whereas almost any other forested area on Fraser Island now has an uncomfortably thick understory, the mined area and the Blackbutt monoculture is now relatively bereft of any woody understory. The experimental Blackbutt plantation established by the Queensland Forestry Department in 1975 40 years later. The area wasn’t actually mined but is adjacent to a mined area over the hill.